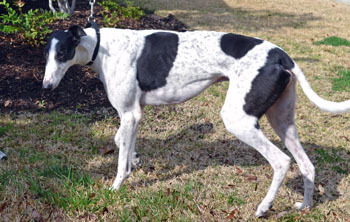 Smoke, aka CJC's Smoke, is a 4½-year-old white & black male born July 8, 2007. His sire is Dragon Fire and his dam is Greys Real Nifty. Smoke has 53 races to his credit on Greyhound-data.com, all at Wheeling Downs. His first race was on February 6, 2009 and his last on June 27, 2010. This big boy was stressed by his trip, and is resting in a foster home after being treated for hyperthermia. He is fully recovered now and ready to find that special forever home! Smoke has been deemed cat trainable. Where there's Smoke, there's....spots? Smoke has gorgeous black spots on his white body, and there's an even smattering of black ticking in between them - what a hunk! Smoke is a confident, affectionate boy who loves being close to you. He's people oriented enough to be a good only pet, but would also do well with female dog siblings. He doesn't want to share his humans with another male dog. This tall boy loves mealtimes and walks best of all, but recently he's been discovering the joys of toys - he loves long floppy ones that he can shake and toss. Smoke does great with kids. He is a quick learner - he knows the 'crate' command well and settles in there nicely for a meal or a treat and waits patiently to be let out. He knows the house rule about only going potty outside. We're still working on the rule about the kitchen counters being off limits, but he's starting to catch on - those smells are just so tempting! 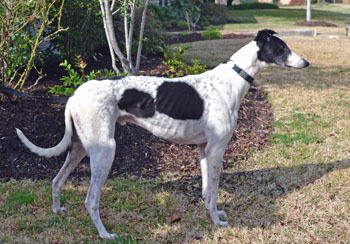 Smoke is a happy boy at heart, and is always ready with a tail wag and a kiss.